If, as with much serial communication, you do not use the handshaking lines, you can use these two lines as outputs. This gives one of the simplest ways to electrically control something, whether LED or optoisolator. Modify the COM port number to suit your set-up. (You can find it via Control Panel). 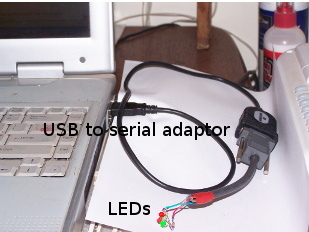 The programs should work on hardware serial ports or on USB serial adaptors. NOTE You can also use DCD & RI as inputs- search http://libertybasic.conforums.com for Rod's clear example. Thanks to him for clarifying this way to use & control the serial port pins. Note too the delays which are necessary to allow Windows to set things up. Here is a demonstration of toggling the lines from a window with buttons.
' Controlling DTR & RTS- in my case on a USB serial port.
' Worked single-stepped but not when run- until struct line REM'd! notice "Com Port Failed to open"
'   Now make sure both are set initially. The next example toggles the lines increasingly rapidly.
' Flashinging DTR & RTS- in my case on a USB serial port.